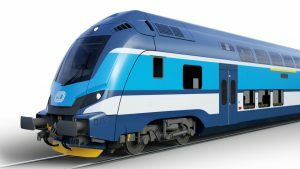 Czech Railways (CD) and Škoda Transportation – Škoda Vagonka consortium signed two contracts for the supply of push-pull double-deck coaches and Regiopanter EMUs. The total value of the two contracts is CZK 7 billion (EUR 271.4 million). 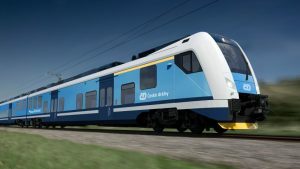 CKZ 1 billion (EUR 38.77 million) is the value of the five three-car sets of double-deck push-pull coaches which will run in southern Moravia, on Ostrava – Frýdlant nad Ostravicí – Frenštát pod Radhoštěm line. The coaches will operate with diesel locomotives, and after electrification works will be completed, the locomotives will be replaced with electric units. The new low-floor barrier-free cars will be equipped with air-conditioned system, Wi-Fi internet access, electric sockets and large spaces wheelchair users. All five sets will be put into service within 25 months, starting in the spring of 2021. The cars will be designed to operated at speeds of 160 km/h. The second contract envisages the supply of 50 Regiopanter EMUs valuated at CZK 6 billion (EUR 232.63 million). The initial batch is for 31 EMUs with a total value of CZK 3.6 billion (EUR 139.57 million). The first electrical units will be delivered in 2021. The units are equipped with a modern information system, Wi-Fi, CCTV and ETCS equipment. They are designed to run at speeds of 160 km/h.